I read virtually everything of Susan Sontag’s while in my 20s, and felt very clever indeed. I seem to recall buying this book on one of my first trips to London, in 1995. What was the name of the bookstore… Blue Moon? No. Silver Moon. I bought a bunch of Angela Carter books there, too. So why didn’t I read this book? Perhaps a general Sontag burn-out, or perhaps I just thought the cover looked boring. 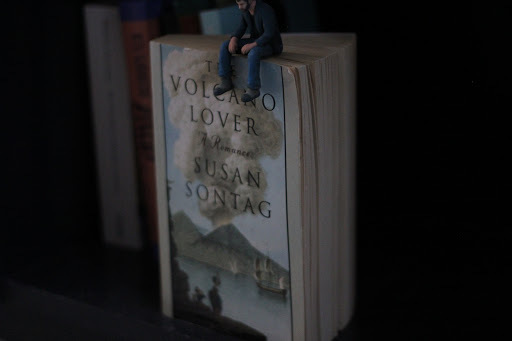 And the title: “The Volcano Lover”. With the subtitle: “A Romance”. I could just envision some dreary heartfelt tragedy. Which it turns out to be. And not at all, at the same time. It’s a book mostly about collecting, and why we collect stuff. And volcanoes. Oh, and some stuff about Emma Hamilton, her lover Lord Nelson, and her husband. It’s rather fabulous. It’s written in a semi-oblique amusing fashion, where Sontag never actually names Lord Nelson, but calls him only “the hero”. But I’ve read enough Patrick O’Brian to guess who it is. Haha! Can’t fool me! Anyway, parts of the book is kinda essay-ish. Sontag does name a large number of people, but others are only names as “Sir ***” or “Viscount ***”. I guess I could google to find out if anybody figured out why, but, on the other hand, I could go read Gasoline Alley. Previous Previous post: I Can Haz Rose Garden?